For IF: a wise guitar player. In the Japanese Shinto tradition, kami are traditionally forest spirits, imbued with mononoke, or world spirit. 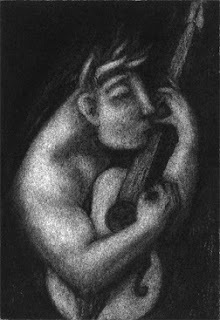 This is a charcoal drawing of Carlos Melendez, a fine guitar player whose skill makes it seem as though he has tapped into mononoke when he is making music. What a fine image you have created out of this. I love your work! I find it so inspiring, especially since I love black and white, graphite and charcoal! Once again, you are an inspiration!